I'm definitely playing in the kitchen with more GF baked good recipes and I love that this particular bread was so easy to come together. 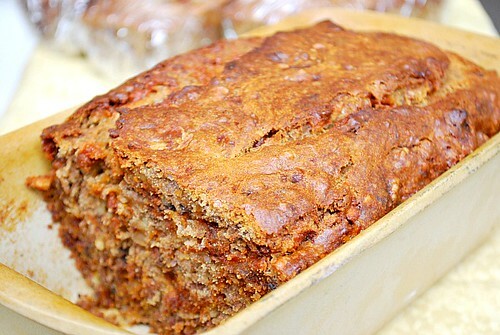 The combination of sweet bananas, toasted walnuts and cinnamon chips swirled throughout really make for a special quick bread. I used leftover slices to make french toast one day and the bread also freezes beautifully! In a medium mixing bowl, whisk together the flour, xanthan gum, baking soda, cinnamon and salt; set aside. In a large mixing bowl, whisk the eggs with the sugar. Slowly add the oil in a steady stream while whisking. Add the bananas, and vanilla extract to the egg and oil mixture. Mix to combine. Slowly add the dry ingredients a half cup at a time to the wet ingredients in the bowl, stirring constantly to fully incorporate. Fold in the cinnamon chips and walnuts. Grease a loaf pan and slowly pour in the batter. Bake the bread in the preheated oven for about 55 minutes to an hour, or until a toothpick inserted into the center of the bread comes out clean. Cool the bread in the loaf pan until safe to handle before removing from the pan and onto a wire rack to fully cool. This bread sounds amazing! Love the cinnamon!